Hey kids, the new King-Cat is available NOW! If you have a subscription, look for your copies to arrive soon. If you'd like to order a copy, info is below. Also, I'm heading out on tour tomorrow, the day after Thanksgiving. I'll be visiting the following cities, so come on out and say hello! *Illinois residents, please add additional 7.25% sales tax. So there I was heading east through the darkness towards Pittsburgh: Quad Cities, Chicago. I got lost in NW Indiana and ended up in Michigan, where I almost hit a wayward deer. Then Toledo. I made it a little bit west of Cleveland before calling it a night. Woke up at dawn and drove into Pittsburgh a few hours later. Dawn rises over the Cuyahoga. I was in town for the Pittsburgh Indie Expo, held on the beautiful top floor of a renovated warehouse. I was excited to be back in PGH, because I've made a few pretty good friends there, and, in the days leading up to the show I was able to convince Dave Kiersh, one of my favorite artists, to make the trip out from Long Island. And it's always great to see him. The show went well. There's a strong but steady creative vibe in Pittsburgh that I really like. It's like half east coast, half midwestern. Which is a pretty cool combo. 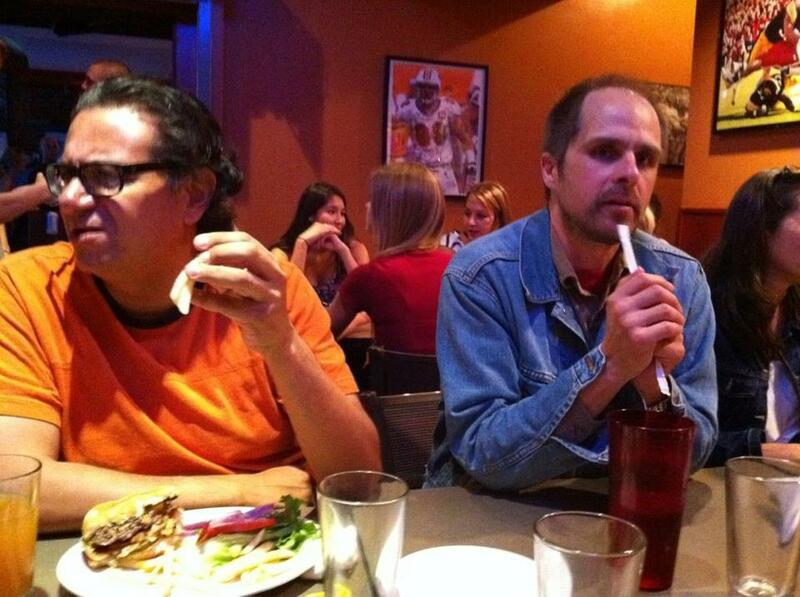 Dave Kiersh makes a new fan. Views from the PIX space. Dave Kiersh makes another new fan. Jim Rugg's cat, Kirby, AKA: Trouble With a Capital T.
I left St. Louis early on Tuesday, heading east across the border to Collinsville, IL, and the Cahokia Mounds State Historic Site. Cahokia was an enormous indigenous city of the Mississippean Culture, a mound-building society, lasting roughly 600 - 1400 AD. Eighty of the original mounds are still present, ranging from short inclines, to "Monk's Mound," which covers over six acres, and rises to a height of 100 feet. All the mounds were built by hand, bucket of earth by bucket of earth. Check out the Wikipedia Page for more info. The mounds were a sight to see, and one could spend hours in the interpretive center learning about this remarkable prehistoric culture. Monk's Mound from the east. Facing south from Monk's Mound, with a view of another, smaller mound across the road. View of Downtown St. Louis, from the top of Monk's Mound. Refineries of some sort, to the northwest. Reproduction of Cahokian woodpecker artwork. After Cahokia, I drove back into Missouri, heading north through Hannibal towards Iowa City. At the Iowa border, I decided to take a detour to Keokuk, another town I'd long gazed at on maps without ever visiting. It was a beautiful river town which had obviously seen better days. I was too sad to take pictures, and anyhow, I still had a couple hours till Iowa City. View from my room at the Hotel Vetro, the nicest place I've ever slept. James Sturm, Felix de la Concha, and John P. at a fancy dinner Tuesday night. Photo by Phoebe Gloeckner. I was in town for the University of Iowa's "Comics, Creativity, and Culture Symposium," a four-day look at comics, featuring panels, presentations, workshops, and an amazing gallery show. Sturm's hand, Felix, JP, conference organizers Corey Creekmur and Rachel Marie-Crane Williams, Jessica Abel; Photo by Phoebe G.
With Luis Humberto Crosthwaite; Photo by Phoebs. Rachel Marie-Crane Williams opens the conference Wednesday morning. "Comics and Pedagogy" panel, on which I learned how to pronounce the word "pedagogy." 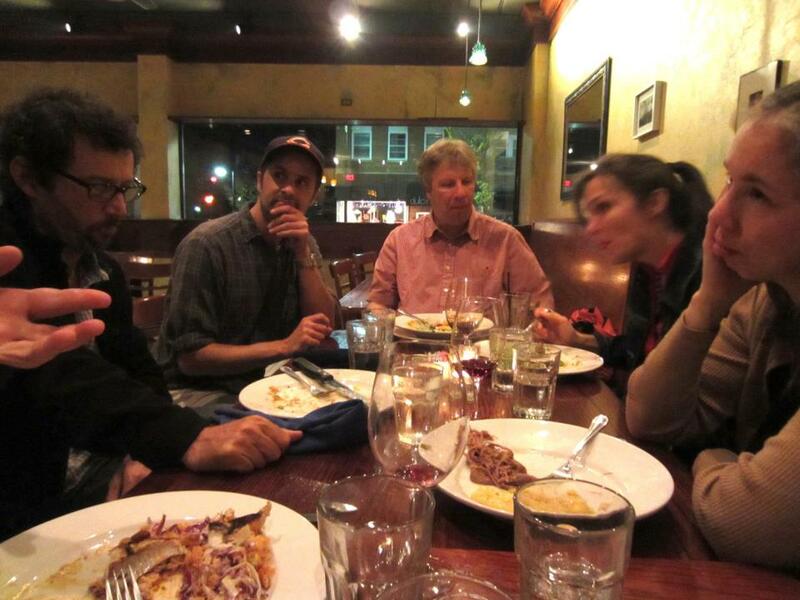 L-R: Jessica Abel, James Sturm, John P. Photo by Peggy Burns. 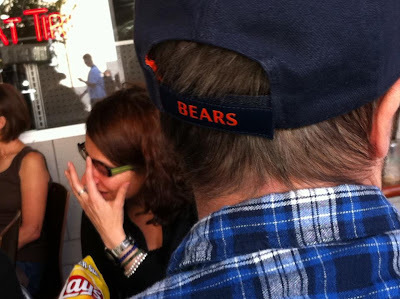 Da Bears; (Conference organizer Ana Merino adjusts her glasses.) 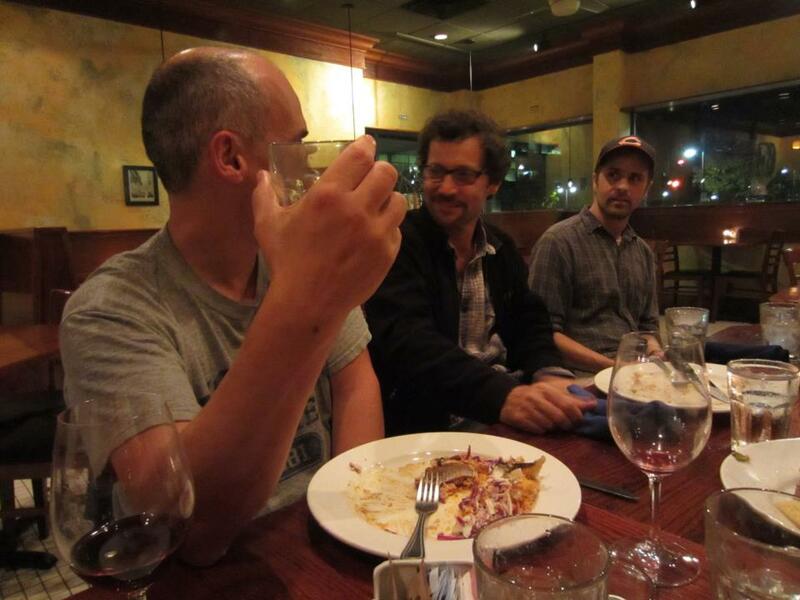 Photo by Phoebe Gloeckner. I left Iowa City at 5 PM Friday and started driving east. I had to be in Pittsburgh (667 miles away) by 10 AM. I made it. I headed north on the Great River Road towards Chester. To the east were beautiful wooded bluffs, to the west the vast floodplain of the Mississippi. Gradually, the truck traffic got worse, and then I was in Chester, Illinois-- the birthplace of E.C. Segar, creator of Popeye. At the first stoplight coming into town, I looked straight at the Popeye-themed City Park and the Popeye Museum. I parked the car, grabbed my camera, and got out. Popeye mural on the wall of the Museum. Wimpy statue in the city park. There are statues of Popeye characters going up all over town. From a memorial dedicated to those Chester residents lost in battle. Are these Civil War soldiers the origin of "Jones. One of the Jones boys"? Mural on the back of the Museum. Concrete porch supports behind the Museum. Olive, Swee' Pea, and Jeep; across from the courthouse. Looking down to the river, from behind the courthouse. And the man himself, looking out over the river bridge to Missouri, at the Chester Welcome Center. The only bridge crossing for 100 miles; Chester, IL. Crossing the channel into Kaskaskia. Kaskaskia Island is a flat, flood-prone region devoted exculsively to agriculture. It was formed when an 1881 flood rechanneled the river, leaving Kaskaskia on its western bank. Once a thriving French colonial settlement (with a peak of 7000 people), the 2010 population was 14. Kaskaskia Island, looking out toward the bluffs on the eastern bank of the river. Church of the Immaculate Conception (1843). "Liberty Bell" Shrine. During the flood of 1993, this building was completely underwater. This bell was a gift of France's Louis XV to his important colonial outpost in 1741. Falling into British hands following the Seven Years War, the city was liberated during the American Revolution on July 4, 1778, and the bell was rung in celebration. Since then, it has been known as the "Liberty Bell." We stayed up too late talking about life, comics, publishing, politics, history, etc and I made a vow to come back down soon so he could show me* around his favorite St. Louis neighborhoods. I got up the next morning and said my goodbyes, heading across the river again to visit Cahokia Mounds, a mysterious, prehistoric Indian civilization that was at one point the largest city in North America. *Haha, I said "Show Me." Buy the beautiful Popeye collections from Fantagraphics! Read about Kaskaskia's demographics at Wikipedia.